For quite some time now, I’ve been trying to convince a dear friend of mine to get a Ladybug tattoo. It all started when, over cheesecake and coffee one night, I asked her what she’s always wanted to do but has never done, and she brought up her wish to get a Ladybug tattoo. See, as a little girl, her father nicknamed her “Ladybug,” and even though their relationship has been rocky over the years, her safe place remains reminding herself of who she will always be: Ladybug, cuddled up as a content little girl next to her father. Of course, I was full-throttle toward the idea – Let’s go right now and get that tattoo! And, in the moment, I think she would have done it. However, we were in Small Town, U.S.A., and there were no tattoo shops open that late. Still, getting a small Ladybug tattoo on her foot or ankle has remained a topic of conversation between us. Her husband and mother are against it, and I understand respecting their opinions. But, I believe whole heartedly in the positivity of daily reminders of how special we are, and I know that, in even the toughest of times, she could glance at that little Ladybug tattoo, and it would immediately reminded her not just of how special and loved she is, but that she, too, has wings with which she can soar on her own. If there’s a tattoo to get, hers is among the most poignant. 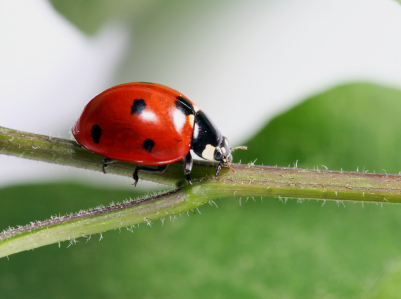 Fortunately, we all have Ladybugs in our own lives, daily reminders that can lift our spirits when we think of them. Yet, if they aren’t right in front of us, we can often forget that they’re there. It’s so easy to get caught up in all of the negativity that surrounds us and forget who we really are, how much potential we have in our lives, how special we are. Bad days and tough times can be like wearing blinders: we see all of the negativity in front of us, and don’t realize all of the good that still surrounds us, that’s still within us. I recently had one of my worst days in a long time. I’d been going nonstop for three weeks with work, various projects, my daughter’s extracurricular activities, and on and on – so by that Friday morning, I was exhausted. And, by 10:00am, I’d gotten word that two friends were having very serious crises in their lives, and by 11:00am, I had to address a difficult situation at work – and it was just going on and on, bad news after bad news, where I was thinking, Please make this tidal wave of a bad day stop! You know, those days when you think, There’s no way things can get any worse, but then they do! Yet, I reminded myself that temporary negativity is just that – temporary – that while I had to address the bad stuff in front of me, I could still see the good that surrounded me. If nothing else, I would eventually go home to my own Ladybug – my daughter – and our two silly dogs, where their presence alone would remind me that all was fine, that there’s so much to be thankful for. There’s a simple truth, that what we look for in life is ultimately what we see. And, sometimes the positives in our lives aren’t as easy to see as the negatives, especially in the heat of a moment. But, the positives are always there if we just look for them – and when we stop to truly look, they’re as clear as a Ladybug tattoo that reminds us every day of how fortunate and loved we really are.